It gives me great pleasure to invite you to the Asia Thoracic Cancer Care Summit (ATCCS), Hong Kong 2018. The theme of the meeting is “Overcoming Challenges through Collaboration and Innovation”, which is reflected in the diversity of the program with a broad range of topics across different specialties. This year, the leading institutes in the world from US, Europe and throughout Asia on thoracic cancer management and related disciplines have again lent their generous support in creating a truly inspiring program. Through lectures, discussions, and workshops, we hope to bring you the most updated information and latest trends, share with you our research and innovative ideas, and inspire you with a glimpse of future techniques and technologies. We warmly welcome you to the vibrant city of Hong Kong, to celebrate with our renowned faculty the recent progress, to start new and rekindle old friendships, to share new ideas, and to be part of the collaboration and innovation for the future management of thoracic cancers. All registration has been full. *Limited capacity and first-come, first-served for “ENB Workshop” and “VATS Animal Wetlab”. Delegates enrolling to these sessions will be informed of successful registration via email upon receipt of registration within 7 working days. If the workshop / wetlab sessions have been full, participants may choose to either join the lectures only (ie: Option D) or completely withdraw from the Programme enrolled. Notification of cancellation must be made in writing to the Secretariat. For cancellation request received on or before 28th February, 2018, 50% of the registration fee will be refunded. No refund will be made for cancellation received after 28th February, 2018. The personal data provided by registrants / applicants will be used by the Department of Surgery, CUHK for the purposes of processing registration to the workshops / conferences and delivering information of current and future events. The data will not be transferred to other external parties except for the co-organizers of events for communication of programmes / events purpose. Under the provision of the Personal Data (Privacy) Ordinance, registrants / applicants have the rights to access to and request the correction of the personal data. 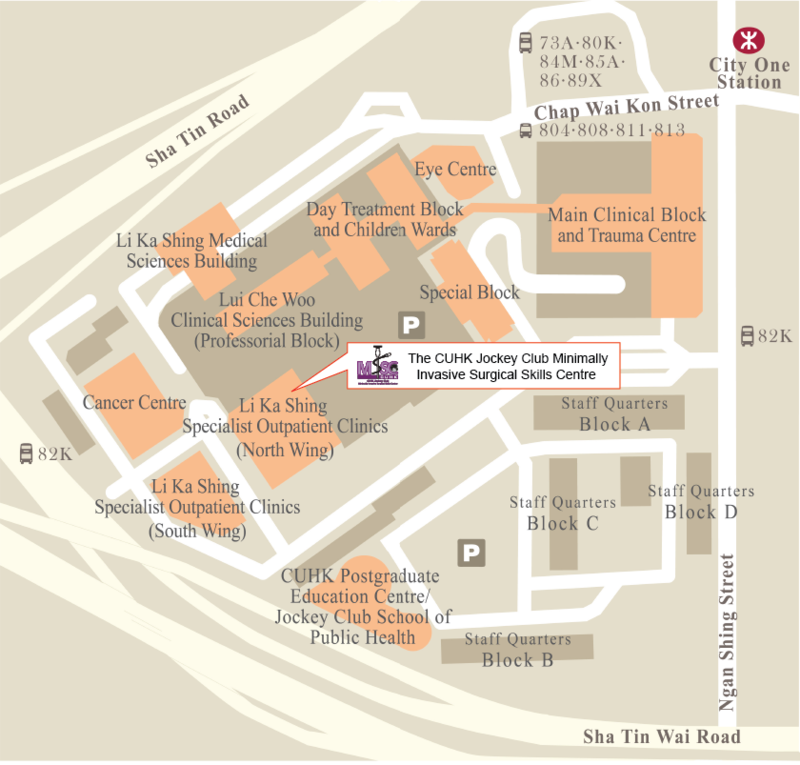 Applicants may submit written request to <ATCCS2018@surgery.cuhk.edu.hk> if necessary. A Certificate of Attendance will be issued and distributed to registered delegates onsite. The Organizer does not shoulder any responsibility for individual’s medical, travel or personal insurance. Delegates are strongly advised to make or review their own policies. Hong Kong has sub-tropical climate. The weather in April is generally fine, mild but a bit foggy. Temperature ranges from 19°C to 28°C. Relative humidity is around 83%. Detailed weather information is obtainable from the Hong Kong Observatory. Visitors to Hong Kong should hold a passport with at least six months' validity. Nationals of about 160 countries and territories may visit Hong Kong visa-free for a period ranging from 7 days to 180 days. The Organizer is NOT responsible for individual’s visa arrangement. Participants should check with the Chinese embassy or consulate at respective home town for the visa information. One may also check to learn whether a visa is needed to enter Hong Kong from the webpage of the Immigration Department of Hong Kong. Chinese and English are the official languages with Cantonese being the de facto official spoken language in Hong Kong. Most people in the service industry speak Cantonese, English and Mandarin. The local currency unit is Hong Kong dollar (HK$) which is currently linked to US dollar (US$) at an exchange rate of HK$7.8=US$1. Most foreign currencies are easily exchanged at banks, hotels and money changers. Credit cards are widely accepted at major hotels, large restaurants, department stores and shops. Most banks in Hong Kong open from 9:00am to 4:30pm on Mondays to Fridays, and some from 9:00am to 12:30pm on Saturdays. Hong Kong is a geographically compact city. It is highly mobile with efficient public transport system. Mass Transit Railway, bus, mini bus, tram, ferry, etc. are the major transportation means. “Red” taxis serve most of the territory-wide area except for Tung Chung Road and the south side of Lantau Island. “Green” taxis are fundamentally confined to the suburban areas in the New Territories. “Blue” taxis operate only on Lantau Island. All taxis can go to and from the Hong Kong International Airport. Road signs in Hong Kong are bilingual in both English and Chinese. Visitors may learn more about travelling in Hong Kong from the Hong Kong Tourism Board. 7-3-2018 Only a few places left for the ENB workshop and animal advanced VATS wetlab. Register now. 21-1-2018 The ATCCS is recognized by and posted on the European Society of Thoracic Surgeons (ESTS) website events calendar. 19-1-2018 Finding Subxiphoid VATS difficult? Come to our 14th April wetlab to see the latest ultra-long subxiphoid instruments from the Scanlan range. 27-12-2017 Attend our Electromagnetic Navigation Bronchoscopy (ENB) workshop and learn how to perform and start a ENB program, by world renowned expert Prof. William Krimsky, and other Asia pioneers of the technology. 23-12-2017 Meet the President of Asia Thoracoscopic Surgery Education Program (ATEP), Prof. Sanghoon Jheon at the ATCCS 2018. 21-12-2017 Learn about the present and future of peripheral EBUS from its pioneer Prof. Noriaki Kurimoto. 8-12-2017 Join our meeting and wetlab to see and experience the latest electric-smart endostapler from Medtronic, SigniaTM.